Jim is currently in his 11th season as head coach of the University of Miami baseball program and has continued the tradition of excellence in UM Baseball. In his 10-season tenure at Miami, no other program, nor head coach, has qualified for the College World Series as much as Morris and his baseball Hurricanes. Miami, which has qualified for the NCAA Tournament a record of 31 consecutive years, has made it to Omaha in eight of 10 seasons. In fact, Coach Morris set a new NCAA record for guiding a program to the CWS in each of his first six years at UM. In addition, Morris has won a record 10 consecutive NCAA Regionals, dating back to his first year at Miami in 1994. Up to this season, Morris has directed the Hurricanes to a 472-165-2(.740) mark. Including his 12 seasons at Georgia Tech, Morris has won more than one thousand Division I collegiate baseball games during his 22 plus years. Jim Morris has been a head coach at the collegiate level for 26 seasons and has recorded an overall 1,062-433-3(.710) mark. 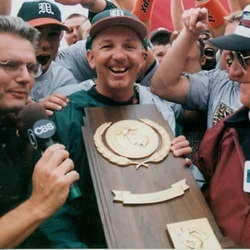 The University of Miami, with Coach Morris at the helm won the College World Series in 1999 and 2001. In 1999 and 2001, he was named National Collegiate Baseball Coach of the Year by Collegiate Baseball, and in 1994, 1999, and 2001 National College Coach of the Year by the American Baseball Coaches Association. Morris also has international experience having coached teams in the Presidential Cup, IBA World All-Star Game, and the Pan American Games. Coach Morris is still coaching the Hurricanes to new heights by setting the current NCAA record of 37 straight years in post season play.